If you haven't read them, please take the time to read Part 1 and Part 2 of this series for background on the cooler and its construction. Well, I've been using the cooler for just over 1 week, and it's now a permanent part of my scope. 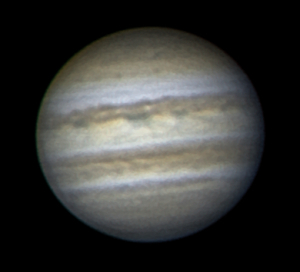 The improvement has been dramatic to say the least, and there is the unforseen bonus that I can now be setup and actually imaging only 1 or 2 hours after putting the scope out. I've owned this scope (and this mirror) for 14 years, and finally this puts an end to the frustration of waiting for the scope to cool down! In the previous part of this series I talked about the problems with my heavy duty 25A power supply causing other computer gear to malfunction - this showed up as gaps in the temperature charts while I had to wait for it all to reboot. I've solved this problem by replacing the 25A supply with a normal 350W computer power supply. The new supply is much much lighter, and is rated at 12A on the +12V rail (more than I need to run the cooler, the scope and tube heater). Consolidating these power supplies into one unit has made life a bit easier, and now I can switch the cooling on and off at will. Taken from my backyard in suburban Canberra, shooting over the neighbours roof with Jupiter at about 45 degrees above the horizon, this is about as good as the seeing will be. I'd have to head out of town to make much of an improvement over this. After about half an hour the mirror had once again become warmer than the ambient air and so the cooler was switched back on again for a while. You can see that the mirror starts cooling straight away (at about 2135). You can see brief periods in the MIRROR line where the cooler was switched off so I could grab some images. These periods are at 2150, 2210 and 2220. Each of these periods shows up as a levelling of the mirror temperature. The tube INTERNAL temperature was all over the place - it was affected by waste heat from the cooler leaking back into the tube (that's why it suddenly spikes upward sometimes when the cooler is operating). I tried to plug up these leaks but as you can see from the graph I wasn't always successful. Knowing the temperature of your scope and having a means to cool or heat as required opens up new opportunities for capturing high detail without being at the mercy of the weather or an overly thick Pyrex mirror! The total parts and manufacturing cost for the cooler (2 peltier units, bits of waste aluminium and perspex, the cold plate and aluminium cylinder) for me was around AUS$300.00. I could have cut this in half had I chosen to do more of the work myself (but then I might not have ended up with a good result!). The computer power supply to run it cost AUS$35.